Do you ever feel no matter how much you do, you still don't feel satisfied? Do you ever feel like your effort doesn't matter... Like no matter how much you give, people around still don't appreciate it? Diana felt pretty drained when she asked me for help. She was exhausting herself at work and couldn't make relationships with her boyfriend work. She clearly had some achievements in her life, but it seemed like her close ones never cared to notice it. - Do you know what the goal is...? What are you looking for? - This feeling... - she paused, - the feeling.. that I did something that matters. I knew Diana for a while before she became my client. It didn't surprise me that she felt this way, but I knew for sure that she had a lot to be proud of. - Diana, - I said softly, - do you think if you take more to do, or keep exhausting yourself, it will help you feel fulfilled? Haven't you already tried this? - Wait.... - she groaned, - are you saying that I take more and more even when my plate is full because I hope it will give me this feeling...? First, we looked why Diana never felt enough. She was great at school, but her parents were so busy with a big family, they didn't know about it. Teachers didn't complain about Diana so her parents never even went to PTA meetings, they had no idea she was a very accomplished student. Diana said she was over her parents' indifference. She did a lot of work on herself and overcame resentment she used to have. Although it was true, we found out that her way to deal with lack of approval as a kid was the extra responsibility she took for her friends and classmates. Diana spent nights doing tests for those who fell behind, covered her classmates all the time even when she felt it was wrong to do it. Sometimes they even called her "Lifesaver Diane." She couldn't get the approval she needed from her parents as a child, so she was trying to replace it by being responsible for everyone she knew. She didn't know how to say no because her feeling of worthiness depended on other people. When she realized that, it helped her to let go this wrong belief, forgive her parents who did the best they could. Now she feels connected with the source of worthiness and strength inside. Working with Diana and many other women, I realized that often we repeat the same patterns. There are many assumptions we subconsciously adopt that prevent us from seeing our worth at work or in relationships. 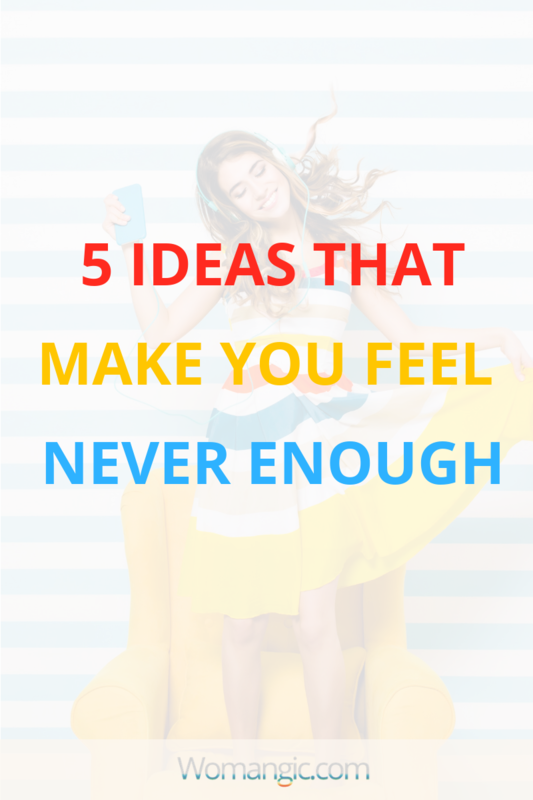 Here are 6 essential ideas you need to change to understand your worth. Before we go to the 5 mindset tricks that help you to understand Your Worth, that already helped hundreds of women to raise their value, including Diana, who managed to connect to her worth, when we changed these beliefs for her, just a quick reminder that the S.P.I.R.I.T formula online program is open. If what I talk about resonates with you, promise me you learn how to understand your worth as a woman, it will radically change your life. If you're ready to do it, S.P.I.R.I.T formula online program was developed with this in mind and heart. If you know your worth, you feel happier, you are connected to your power and can find a solution to any problem. A woman who doesn't know her worth will doubt herself even when she has the perfect circumstances. 1. Eliminate "Good Girl" syndrome. Make decisions based on what you want, not what you need to do to be likable. Stop being a comfortable woman! "Good Girl" syndrome deeply rooted in our culture. My dad raised me as a feminist, but in a conversation, he can easily say: "Women are born to serve." I stopped him once and asked: "How you can say something like this? Do you want it for me?" He didn't get why I was asking. "It's just what it is..." - he replied. Often our family or society makes us believe that "to be nice" is the most natural and needed thing for a girl. It takes strength and dedication to change your perspective from "always being nice" to "doing what I want." While it is critical to be there for people around you, it shouldn't exhaust you or conflict with your interests and well-being. 2. Free yourself from the need to always be right. It's essential to have strong values, but personal growth is often about changing our beliefs, forming a more positive mindset and being flexible about things that don't serve us anymore. When we're closed to the opinions of others, we limit our growth. It doesn't mean that we have to agree with them. But when we accept that the world is bigger than we think, it opens opportunities and frees a lot of energy we spent on proving someone wrong. 3. Let go of a need to control everything. Trust yourself and trust the Universe. Many women (and to be honest I am not an exception) are obsessed with control. The funniest thing is: if you ask any of us about it, we will deny it furiously. "Control..?! Who? Me?! NO WAY!" Imagine, we have a limited amount of psychological energy we spend on things like making decisions, controlling things, proving ourselves. If every day you try to control everything around you, how soon will you burn out and feel exhausted? When we try to take a world on our shoulders, keep in check every single detail (which is rarely needed) we spend an enormous amount of energy. This energy you can spend on your growth, well-being, creativity. Constant state of low energy, moments when the world pushes away our control makes us feel not worthy. Often we want our close ones to behave in a certain way; we want appreciation, respect. We demand, ask million times and then ask again, we control. Sometimes we don't even notice how it happens, over caring comes from a very pure intention... to care. Control is a mix of extreme care and fear that says: "if you let it go, the world collapses!" The truth is... the world will be fine. The universe always takes care of you; sometimes we just need to let go and let the world do its magic. Trust is fundamental. When we trust the Universe always has the best for us, we get the guidance and support we need. 4. Free yourself from taking everything personally. Differentiate what you know about yourself with what others think about you. Your family and your friends have a particular image of you. But only you know your real self, your inner guidance is the most important. Don't base your worth or self-esteem on standards or what others think of you. You're unique and sometimes you're the only one who can see the whole picture. If something your close ones says hurt you, it's good to explore why it gives you pain, understand the triggers and work on it. Luckily, there are tons of courses, personal development blogs, and books where you can find insights and help. 5. Stop sacrificing your time and energy. Do anything because you want to, not because you have to. Let go of "have to" syndrome. I see so many women missing something in life and in a relationship… this one small thing, they don’t know how to explain. Our brain is so preoccupied with “have to” “have to” "have to” that we can’t hear the voice of our Soul. We can't connect with ourselves. Do you ever think about the incredible feeling of joy and safety you had when you were a kid? I adore my parents, but honestly, my childhood was far from perfect, but no matter what circumstances were I remember I always came back to the feeling of calm and joy. I realized we managed to do it as children as we were pure love. We were in a deep connection with ourselves. We didn’t feel we have to give and that’s why we were able to give more, feel more, enjoy more. Of course, as adults, we have more responsibilities and obligations, but if you will be honest with yourself: does it the same as feeling the constant threat and tension? And how many things are there that you really have to do...? Or do you choose to take responsibility for everyone around? The Universe mirror your level of self-worth with opportunities, people you meet and the way others treat you. Often Life pushes us to step into our power through negative experiences or aggressive people. Have you been there? I did. Until I realized: Why wait for that?! There are tools, tips, and tricks you can use today to understand your worth, connect with yourself, balance your life. We have it in S.P.I.R.I.T. 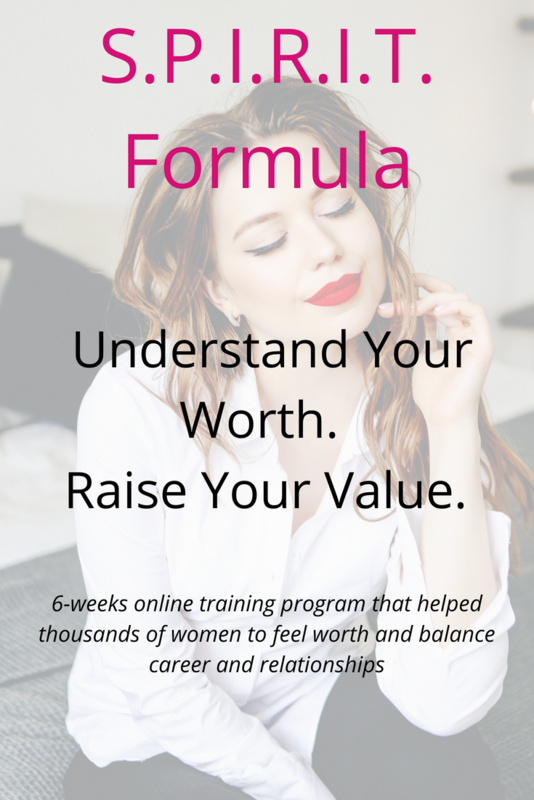 formula program: A 6-week signature online course that already helped thousands of women to understand their worth and balance their career and relationships. These principles are what I used and still do to transform my life, everything in the program is personal to me. It's synthase of experience, years of learning and practicing coaching, psychology, and meditation.